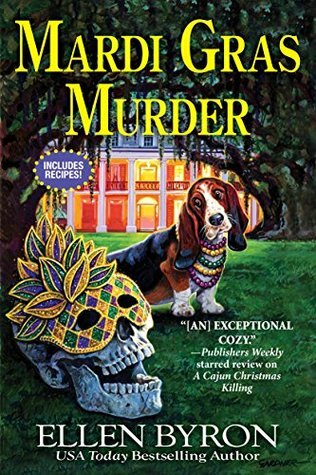 Mardi Gras Murder, by Ellen Byron, is the fourth book in the Cajun Country Mystery series. The body of a stranger is found in the Crozat family's backyard after a flood. Everyone is gearing up for the big Mardi Gras celebration that's to take place in Pelican. When one of the judges of the Gumbo Queen pageant is murdered, it's up to Maggie to figure out who the killer is or the celebration may not happen. This is the first book of the series that I have read. I thoroughly enjoyed this book. I loved the Pelican, Louisiana setting and the people of this small town are delightful. I felt like I was part of the community even though this is the first time I visited here. They all brought wit and a laugh out loud humor to the story. I want to visit again and again. The mystery of this story is outstanding. I really like the intrigue of who the stranger was, as well as, who murdered the pageant judge. I love a mystery within a mystery and seeing how everything fits together. I could not put this book down. It grabbed my attention and kept me tuned in until the very end. I would recommend this book to anyone who loves wonderful characters, a small town feel and a mystery that will keep you on the edge of your seat to its the end. I received this ARC copy of the book from NetGalley and Crooked Lane Books for review. This is an honest review. I am definitely going to check out the others in this series.